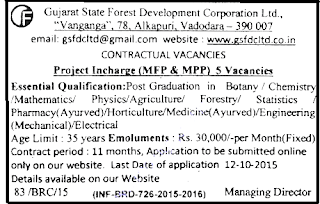 Gujarat State Forest Development Corporation Limited (GSFDCL) published notification for recruitment for below mention posts on 11 months contractual bases. You can view official notification by following link. Name of the Posts: Post Graduation in Botany / Chemistry / Mathematics / Physics / Agriculture/ Forestry / Statistics / Pharmacy (Ayurved) / Horticulture / Medicine (Ayurved) / Engineering (Mechanical) / Electrical. 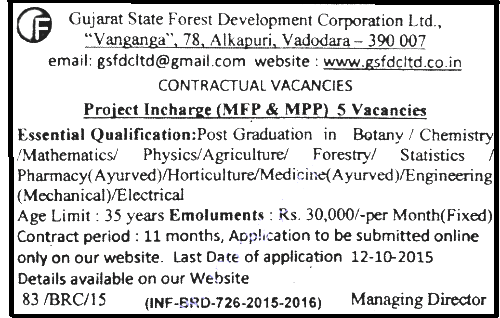 How to Apply: Interested candidates will be apply online through website www.gsfdcltd.co.in.